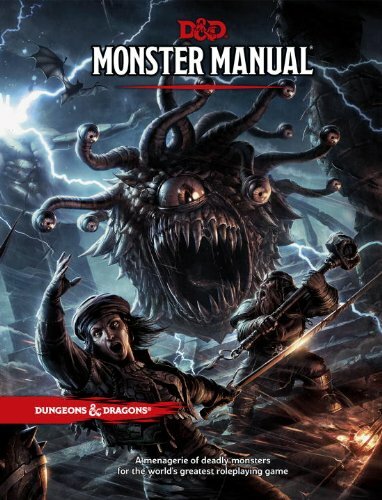 Scheduled to hit WPN stores on the 19th comes the big book of bad guys that every D&D player loves, the Monster Manual! Are your minds and bodies ready? I’m here today to bring you a quick and dirty run through of some of the stuff I love about the new Monster Manual, as well as a few of my favorite creatures from within. So let’s get started, but first I should remind you that I’d like you to join me on Twitch.TV next Monday the 15th at 6pm CST for a live stream of the Monster Manual as I flip through every single page and take questions and comments from chat. Each monster manual entry has at least 3 or more paragraphs that begin with a bolded statement, which acts an idea or declaration about that monster. These miniature to moderate sized chunks of text serve as back story not only help you instantly dream up the where/when/why/how of monster encounters but can also give way to entire adventure ideas. The introduction to the book also does a good job of setting the stage for various environments where monsters dwell and providing suggestions and adventure hooks. Certain monsters like the Tarrasque, dragons, and others are considered legendary, meaning they get special actions they are able to perform in combat, making them even tougher and more versatile adversaries than you’d expect. 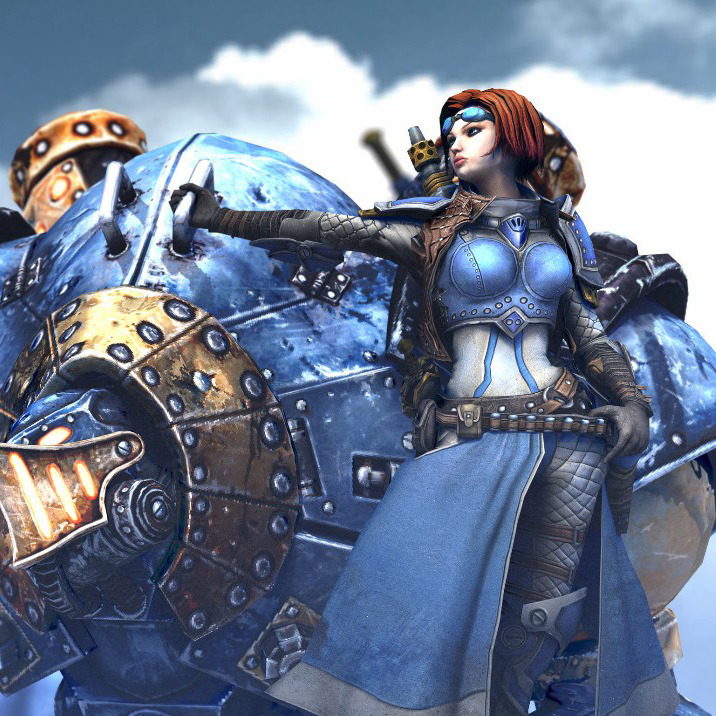 Rich story elements are outlined as well as mechanical bits like regional effects that surround their lair, and lair actions that are taken each round as the monster interacts with the environment. For instance, he black dragon’s lair is surrounded by 6 miles of light fog, rough terrain, and as you draw closer all of the nearby bodies of water are fouled. The lair itself can fill with magical darkness, swarms of insects, and more. The stat blocks are compact and concise, the overall layout of the book is done extremely well. This is a book you’ll want to read just as much as you want to reference it (or don’t reference it because most 5e monsters can fit onto an index card!). There is an emphasis on artwork for almost every single creature outlined within the book and the use of white space is very well done. Monsters are deadly again, it’s not all a grab bag of push/pull/slide/condition mechanics like we were used to seeing in 4e, these monsters mean business. Multiattack is a frequent visitor to many stat blocks, and while at first I was wary of this, after many play sessions I can say that it balances out very well. I feel like monsters are nasty and dreadful once again, not just varying sacks of hit points waiting to be depleted, but unique and threatening. Some of these guys are truly going to strike fear into PCs hearts, some may also strike barbed tentacles into their hearts as well. So here’s 5 of my favorites off the top of my head along with some of my reasons why. Still ever immune to non-silvered weaponry and their ability to completely shred through their enemies, Lycanthropes can pass on their curse to player characters. 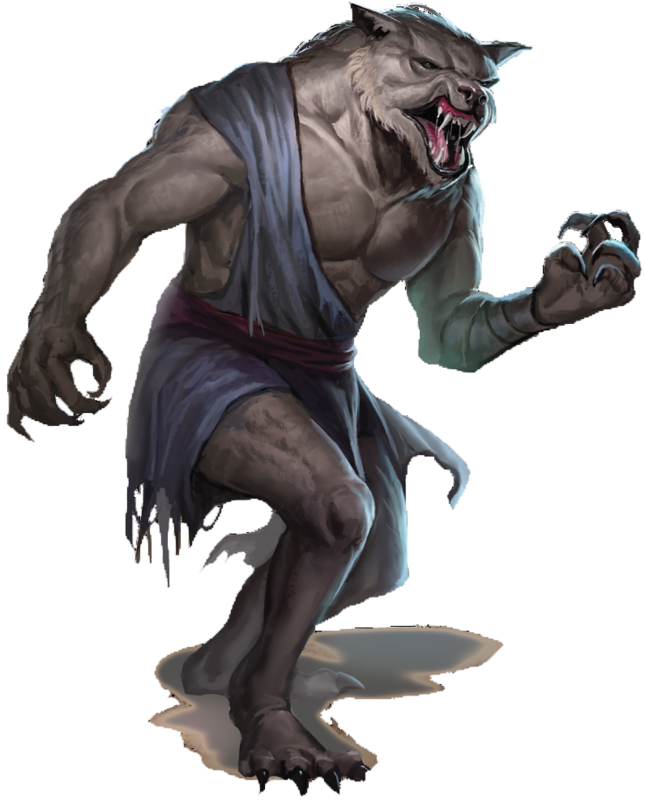 This curse isn’t some 4th edition “fail 3 saves and you’ll get a slap on the wrist” flim flam, this is “fail your save and you carry the curse of the lycan. Embrace the curse? Well then, change your alignment and hand your character sheet over to the DM until it’s cured” serious business. With a marvelous back story recalling how the first ever Harpy was created, we are reminded that divine intervention isn’t always a blessing. Harpies collect shiny trinkets and are regarded as sadistic cowards, their song is deadly as ever too. Players within 300 feet who hear a harpie’s song must make a wisdom save or be charmed until the song ends. Who wouldn’t want to march a band of PCs off of a cliff while enthralled by their cursed melody!? 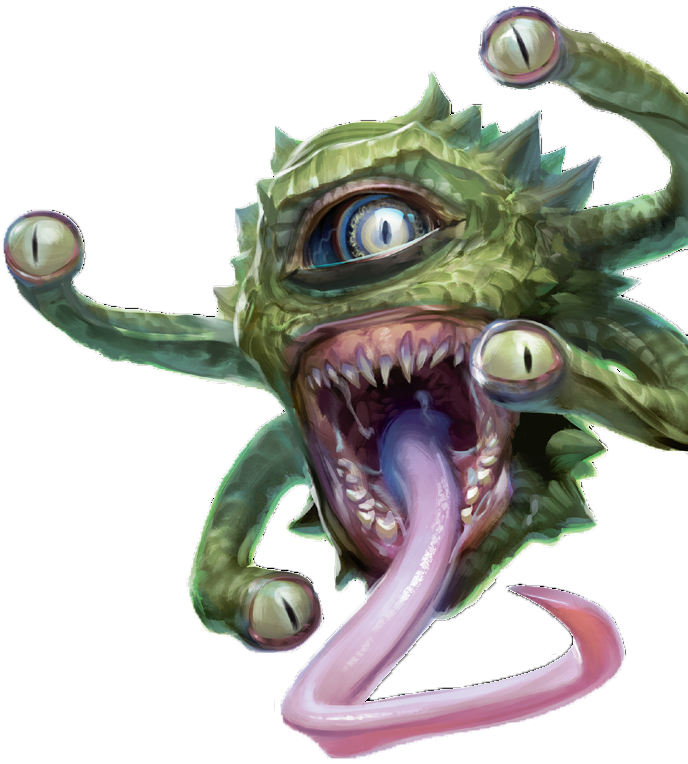 A lesser beholder summoned from another plane by means of a profane ritual involving the severed eye stalks of a greater beholder, Spectators are a great challenge for a lower level group of adventurers. They have spell reflection, 4 different eye rays, and clock in at a challenge rating of 3. Throw one or two of these guys into the starter box adventure and you’re going to have a great time! An undulating ooze of eyes and mouths, the 5e mouther can stop players dead in their tracks by reducing their movement to 0 due to the ground around them becoming the consistency of dough, not to mention their cacophony of laughter, screams, and wails can instill some temporary madness into everything within 20 feet of it. What’s not to love? With the ability to make 3 melee attacks on her turn or 2 ranged with its longbow, the medusa is already a good threat with a challenge rating of 6…but then there’s that other thing they can do. What was it? Oh yeah, Petrification! Fail your CON save against its gaze by 5 or more and you’ll find yourself insta-petrified. Fail it twice, regardless of how close you miss the mark and you’re stone too. Of course, medusa’s are subject to their own gaze if you manage to find a reflective surface. Good luck! Can you tell us a bit about Vampires? I love me some vampires and I’m curious how they work in relation to the playtest. I have my book on order from Amazon but I’ll probably end up buying it locally too so I can have it early. Thanks! I’m not sure I can disclose any more than allowed in this article here, but you can tune into the live stream next week and I’ll be sure to spend some extra time on the vampire page if you’d like! I’m just curious how their bite and regen works. Does bite still require 2 successful claw attacks? Is their regen a fixed amount or a die roll? Are their mechanics for killing them, etc. Thanks again for doing this! If you search for the supplemental Horde of the Dragon Queen pdf that WOTC released, it includes the vampire and vampire spawn information (warning: potential spoilers of what monsters you’ll see if you plan on playing Horde of the Dragon Queen). The vampire is definitely more old school, in my opinion. I’m especially a fan that its big negative energy attack (which is now max HP loss instead of negative levels in this edition for all undead that have been released) is now through its bite instead of its “slam attacks” like in 3.5. Thanks! I own the hardback and looked in there but found nothing. I’ve not downloaded the supplemental PDF but you can bet I will now! I dont have a link, but I believe the vampire stat block was posted on one of the enworld MM forums. I thought it was not shipping til the end of september? The date I referenced was for the WPN local shops and hobby stores. Thanks for the preview. I am really looking forward to having this book. As an FYI, the Spectator does make an appearance in the Lost Mine of Phandelver Starter Set adventure. I’m aware, was mainly aiming this article at anyone who wasn’t paying attention until now, and folks who want to see 4e -> 5e changes. Mainly to whet appetites, the spectator is too cool not to mention multiple times! The spectator is cool! Thanks again for your post. Can you tell us if any monsters provide stats for monster PCs? I’m curious if the MM has rules for Monster PCs, Templates (like 3.5 Vampire, Lich, Dire, etc. ), and Monster advancement ? i would imagine it would be that hard to work out. Traits are basically racial’s, actions that are not weapons (like short sword e.c.t) you would get, if a action has a recharge just make it useable only once per short/long rest. Just need to make sure not to give it the Multiattack or Spellcaster action/traits (Don’t get confused with Innate Spellcaster). seems easy enough. And for ability scores choose the monsters two highest ability scores, if a score is 16 or lower the player gains a +1 bonus to that score. If a score is 17 or higher the players character gains a +2 bonus to that score. I’ve actually been really disappointed at the lack of monster abilities beyond damage and save effects that usually either deal some pretty terrible effects (or just a pile of damage). 5e monsters seem to either be terribly dangerous or laughable depending on whether the dice are hot or not. There doesn’t seem to be that middle ground of a legit, but approachable threat that will mess with the PCs. Great review. Looks like some dirty monster work afoot!